Jon LaCroix is the Founder of VTown Cartel Music, a cus­tom music pro­duc­tion house with a bou­tique music pro­duc­tion library consisting of over 13,000 copyrights. He got his start in the music business as a pianist and drummer, eventually going on to study music at Cal State Northridge. While attending college, he picked up work scoring student films and also scoring and producing for a music library. He has collaborated with artists and companies such as American Idol, Dweezil Zappa, Megatrax, Sound Adventures, Klangwolke, Volvo, Saab and more. Also an experienced touring and studio musician, as both a keyboardist and a drummer, he has traveled with well-known acts like Colin Hay and Blues Saraceno. Jon started VTown Cartel Music in 2007. Since its inception, the library has provided music for a wide range of TV shows, films, networks and companies, including Nurse Jackie, Big Bang Theory, Real Steel, The Mentalist, Smallville, Vizio, 90210, UFC, Ikea, Warner Brothers, McDonald’s, CBS, A&E, MTV and many more. I talked to Jon about his extensive experience in the music industry and how he built up the VTown Cartel Music library. He also shared some insights on the major challenges artists are facing as they try to collect missing royalties for their music and outlined some of the extensive work he has done with TuneSat to try to solve this problem for his own work. Thanks so much for taking some time to share your experiences, Jon. How did you get into the music business? Music was in my family, and I just jumped in. My dad, Lenny LaCroix is a brilliant professional musician from the East Coast and moved out to L.A. and worked on a bunch of TV specials and productions as a writer, arranger and composer back in the day. He worked on award shows like the Academy Awards, and a lot of television specials and variety type shows. I started playing piano when I was five or six, but got kind of sick of it. So, when I was 10 I started playing drums, and then picked up piano again in college. I wouldn’t say I’m classically trained, but I do read music. Besides, most of the things I do are by ear at this point, but if I have to do any real orchestration or arranging, I can make it happen. I played in different groups throughout high school and then ended up going to Cal State Northridge, playing in the A-Band there for four years. During that time I was also doing some scoring for student films and playing drums in a fusion band, Raw Fungus, with these guys from Boston. One of the band members was scoring a lot of reality TV and asked me to audition by scoring a segment for magazine clip show. I found out he was auditioning a few guys and was giving everyone the same clip to work with. I think he said there was one of Hans Zimmer’s guys as well as someone from James Newton Howard’s camp. I think even a guy from Snuffy’s team. Basically, there were a bunch of guys auditioning. In the end, he actually chose my version. And that was the beginning of my real education in writing, also how I made some money while I was in school. I worked for this person for many years handling a lot of his overflow. Years later, the first writers’ strike halted a lot of television production. And I got a call to go on a road with Blues Saraceno playing keyboards – since television production basically stopped and we weren’t going to be working over the summer, I thought this would be fun and grabbed the opportunity to play out. It was the first time I’d ever done that with a rock band, and we played at motocross shows, X Games-type events, though this was before the X Games existed. Since Blues was sponsored by Ernie Ball at the time, we also had to do some music clinics and additional concerts along the way. It was a very tightly budgeted indie tour – new city every day, so the joke was that we could stay at any motel with a “6” or an “8” in the title. Either way, I had a blast. We were playing out everyday and we even got to play the Hendrix Museum in Seattle. The same summer, I also got the call to play drums with on of my childhood idols, Colin Hay from Men at Work. I think I had a couple days off in between those two tours. This one was a much different tour, staying at nice hotels and playing festivals for thousands of people, so it was really fun. 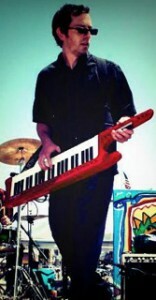 My best friend was playing keyboards for that leg of the tour and it was just awesome. It was a really great experience on so many levels with so many great memories. Colin’s an incredible guy I’m really grateful for that experience. When I got back, I started doing more record production work – not scoring, but actual song production. I did some work for Blues, who was working a lot with Dweezil Zappa and Extreme Music, and then I got to work with Dweezil on this show called “On the Spot” for Warner Brothers. I also did quite a bit of writing and session work with Megatrax, Sound Adventures, and a bunch others doing themes, commercials, songs; whatever would come up. Eventually, I just hit a point where I realized I needed to do something different. I remember we were working on this network promo, and I was called in to do some orchestral programming, and I realized it heading creatively down the wrong direction and there wasn’t really anything I could do about it. That was really frustrating and it was at that time that I realized it was time to branch off and do my own thing. So, I decided to build my own library. I had 200 tracks of my own sitting around and with the help from friends, who also had their own music lying around. They were making tracks at their studios, but were also on tour with huge bands, so they weren’t home long enough to really do anything with those tracks. They offered them to the collection, and that’s how the VTown Cartel library got started. You’ve had a colorful career. You’ve been a performing musician, you’ve done professional scoring, production and have also been a library owner and operator. In terms of touring, specifically, you were able to get involved with people who had established touring routes. What advice would you give someone just starting out as a touring musician? In high school, I had this band director who was really brilliant. There are certain elements of his work ethic and the way he approaches music that have really stuck with me: the way you should be practice; showing up on time; delivering on time; having a good attitude. Because, regardless of whether you’re working as a producer or as a performing musician or anything else, your success is greatly based on referrals. You really need to do the things necessary so that people want to refer you to their friends and colleagues. A few times, I got called by the music directors or tour managers of great acts like Ben Harper, Gwen Stefani, or The Neptunes, Morsey, inquiring about playing keyboards for the tour. It really made me think because these tours were long. And I didn’t really know how to respond because it felt like a fork in the road for my career. The more I thought about it, the truth was, I really didn’t want to leave town for extended period of time. I knew that if I started touring, I would get stuck out on the road for long periods of time. And I didn’t want that. I really wanted to try and build things up in town. But in the end, being successful at touring, especially if you’re a hired gun, is more about how well you get along with the other people in the band. It’s not necessarily about your skills as a musician. You don’t have to be a musical prodigy to tour; but it’s more about executing the material and how you interact with people; how well you get along with everyone on a daily basis that really matters in my opinion. So, my advice would be to try and be easy going and get along. Show up on time and prepared. You mentioned showing up on time. I’m a hobbyist, but I’ve gotten gigs above those far more talented simply because I showed up sober and on time. That is true. And you also have to come prepared. And I’m talking about diving into the details. Another example of this: I’m working on the Stanley Kubrick project that is set to be an exhibit at the L.A. County Museum of Art. There is one piece in particular that needed to be redone, a Strauss piece, The Blue Danube Waltz. It’s not that it’s complicated, but there are certain details with the voice leading and harmony that needed to be executed properly. I get a little tweaky sometimes with that stuff. You’re a guy who runs a music library, places your own music and also places other people’s music. What advice would you give other musicians that want to place their music in film and TV? Is there a science to that? I think it’s really about the relationships you have with people and whether or not they like you and trust you. I present music in our library always from the other person’s perspective and objectives. At the end of the day, music supervisors are working for other people too. And I just try to help make their jobs easier and get them what they need. The reality is, everyone is pitching. We’re pitching to music supervisors, and they’re pitching to their colleagues. And sometimes those people are then pitching to the client. There’s a lot of people involved trying to do what’s best for the project. I always just try to assist that process and make it easier. Not sure if there’s a science, but that’s the approach I take. I think artists often misunderstand that. They think there is one music supervisor out there who can change their entire career, and that’s not really the case. Yeah. And a lot of times it’s hard to get around a deal that’s in place especially if you’re an independent artist or band. That has been one of the challenges, especially in the U.S. for us. We’ll have an editor love our catalog and want to use it, but there’s some deal that’s in place with the network or the production company that actually stops them from using the music they really want to use and that they think is best for the project. That type of situation is very different in other countries. We have a network of great publishers and distributors overseas and we frequently get together to discuss what’s going on in the industry usually at conventions. Internationally, there are territories where there is a pre-cleared blanket license with the providers. What that means is the rates are set and the deal is essentially already in place. You’re not negotiating clearance rates or even if it will clear. They are allowed to use anything for television programing and there is a statutory rate in place for the synch. So, in the end, if you’re music provider, all you have to do is have great sounding music. Theoretically, there is nothing beyond the quality swaying someone to go with another provider. We like that. In the U.S., it’s a little different. It’s almost like you have to get the deal in place ahead of time before you can even get something placed in certain areas. I was fortunate when we first started VTown, because I got a break: I had a friend who made a call to one of the major studios here in L.A. and put a pre-cleared needle-drop deal in place. It opened up a lot of doors and gave us some real credibility. I am still really appreciative! Do you actively look for people to contribute to your library? We don’t really seek people out, but we do keep our options open. I will get a few emails a week about it. A lot of the stuff we do, we make in house. I work with a couple of our producers, and then I also have some people that I am mentoring. I try to teach them how we do things and the level it needs to be at – for example, how the vocals are tuned, the beat detection and editing on the drums – so it’s all solid and consistent. It’s really all about the quality at this point, and that’s what I focus on. I’m very cautious about working with composers, bands, or producers we don’t know. The reason is that right now there are so many composers and publishers who are retitling music which legally exposes the client and is killing the production music industry in my opinion. My take on it – is that it’s illegal to have multiple SR copyright claims on the same piece of music. And not knowing the person makes me nervous, because we don’t necessarily know if they are participating in this practice. There are too many variables. We’ve always been low risk, and I like to keep it that way. Our contract is exclusive, with a full copyright transfer. But a lot of artists don’t realize that a publishing agreement with us, or anyone else for that matter, means that someone essentially owns their master now. I know it sounds on the surface like it’s unethical from the artist’s perspective, but the upside is that we’ll be able to enter it into some third-party deals and distribute it through our network worldwide with no legal issues. I found you because of my relationship with the folks at TuneSat, who said you are an avid user of their service. How have you worked with them? I could probably write a book on the ways I have worked with them to recover royalties, not to mention the many ways the royalty and copyright system is broken. When I explain to people what I do, the conversation ends with the same question – What if your music is used and you don’t know about it? It’s an honest and valid. TuneSat is my answer. The way I found TuneSat provides some real insight into the problems within the industry when it comes to copyright. After we started our library, I got a break and had a meeting for a miniseries on A&E called The Jackson Dynasty. It featured the Jackson family and also focused on the recent passing of Michael. We were really excited about this project, because it really allowed us to really service the show in a few ways. We were asked to provide our catalog as well as produce custom tracks in a really short amount of time. The other part of it was that there were clearance issues relative to Michael’s catalog. We were providing the library, but also had to do a bunch of tracks in a specific style or era. Imagine if they someone went to license one of Michael’s tunes and could only get TV rights, but no web rights. That’s another place where we were able to step up. We also did the cue sheets for the show, and told them that we would take care of it, since it was all our music anyway; we would make sure the proper writers were attributed, etc. So that’s what we did and we knew everything had been done correctly. We put together the cue sheets and then turned that back over to production. About nine months later we got our first performance statement, which is how far behind everyone is. And there was nothing on the statements with respect to the series – not one, single thing. I couldn’t imagine how it was possible, since the series had run and rerun. We had hundreds of tracks involved. That incident is the single thing that landed me on TuneSat’s doorstep. I hadn’t really heard of them prior. Before, I was looking at this part of the industry because I was interested in the technology and in seeing where technology and the industry was headed. And I did some research and thought this company looked exciting and innovative. It reminded me a lot of Shazam for my iPhone, but specific to broadcast. I thought it was amazing, and it really did look like a solid solution without compromising the master – straight waveform and audio recognition with no frequency or code injected into the track. I talked to Chris Woods, the TuneSat president, and I explained the situation and asked for his help. To be honest, at the time, I didn’t really know what to do. Chris asked me if I knew how many times it aired, and I realized at that moment, I didn’t. In fact, I didn’t have any information. Before I signed up for the service, he took me through the back end, because I said I really like to know all of the nuts and bolts of how things are put together. His demo really showed me how detailed and flexible the back end of the system is. Right away, I saw the potential and the advantage in having this setup ahead of time. The really cool thing about this service is that all the shows and music are saved on the TuneSat server. Since BMI, ASCAP and Sesac pay out three-quarters after air dates. By the time you figure out you’re missing something on your statement, it’s almost a year later and almost impossible to recover any information. Even TV schedules, like Yahoo TV, posted online don’t give you any information anymore. So, TuneSat has everything recorded on server and were able to go back retroactively and rescan everything almost a year later. It was a huge relief. So, when you got the information from TuneSat, did you go directly to your performance rights organizations and audit them? Not exactly, only because we weren’t sure where the breakdown actually occurred. We went to audit everything in the chain and learned a lot about the process through this experience. Using the Dynasty series as an example, it didn’t show up on ASCAP, BMI or Sesac. I couldn’t figure out how that was possible or what happened. You just have to keep digging deeper and deeper. When you go through this process, you realize that there are just so many ways the system can break down and that no one is supervising it. You really have to be your own advocate. Because TuneSat was able to go back an entire year and rescan the airings, we were able to find out all the air dates which gave us a leg to stand on as well as the tools to sort everything out with the PROs. I have a theory about PROs: Because so many things have been lost in the system, I firmly believe that if they had to pay out everything that has broadcast, they would not have the float to remain in business. I realize they are non-profit, but I don’t think they would be able to sustain themselves at their current level if they had to pay off all these debts. Yeah, that could be true. My take on it is that because a lot of the networks pay blanket performance rights licenses, it’s really not in their best interest to discover and pay out on every performance. The networks are paying a lump sum, and the PRO is dividing that money out based on their own criteria like type of usage, channel or network, time, whether it’s prime time or not, ratings, etc. They’ve already got their money, so I think they don’t really care what goes missing. A missing cue sheet is completely irrelevant to a network, but also to a PRO in many cases. Yes. And to this day, we still have problems related to Dynasty series. Internationally, we’ll see the series pop up, and our international statement will show that they only showed one episode, like five minutes of Episode 3, which is not likely. Do you have any advice for people trying to recover their missing royalties? I see this situation a lot: Musicians will say, “I know for a fact it was spun, and I have nothing on my report reflecting that.” How do you take it to the point where you get paid? There have been multiple cases where TuneSat has discovered performances, and we discovered they just went missing due to human error. We do a lot of stuff for one of the popular music channels. We’ve realized that sometimes when people make the cue sheets, tracks go missing. The good news is that TuneSat actually records mp3s in the context of the show. So, you get an mp3 of your track within the context of the show for every single detection. And I can send this to the supervisor or coordinator and ask them to double check the cue sheet. And the coordinator will get back to me and say that they just missed it and update the cue sheet. Problem solved. Another perfect example, and the latest thing that’s happening over here is that there are a bunch of sports promos we did. And these promos run over multiple networks and channels. So, we’ll find out three quarters later that these performances aren’t on a PRO statement. We have to go back and figure out what happened. When these types of royalties go missing, ASCAP has refered us to their promo checklist. And we give them everything: the first air date; the first line spoken; product; track, etc. Can you imagine trying to go back in time and get the first air date and first line spoken a year after it aired? We can find this out through TuneSat pretty quickly. It’s just another way we use their service. We can then send a spread sheet to Ascap with the entire airing schedule including all of the dates, times and channels where it ran. Without TuneSat, I might have to write the production team attached to these spots and ask “Can you send us a copy of the promo?” which would be a nightmare for everyone. But TuneSat provides us with mp3s – hundreds of them. Not only does TuneSat give you a spreadsheet, so you can see which country, channel, etc. it aired on, but they also send you an mp3 with a 10-second buffer on it, which is killer. Because, a lot of times you need to listen to the track really carefully in context to make sure you’re taking credit for the right track, and it’s not just an Stylus loop that’s triggering the detection. If we didn’t have TuneSat, we wouldn’t be able to even attempt to recover some of these missing pieces. I actually was just writing to my admin Karyn, who is overseeing a large portion of this process. And I said to her, “How we do this without TuneSat?” If we didn’t have this as a tool, we wouldn’t have any chance of figuring out the answers to the questions ASCAP and the other PROs ask us. In this case, they were asking for all the air dates of this promo that is appearing over multiple networks. In a lot of ways, through this process, it feels like you’re being asked to do their job for them. It’s insane. At the same time, I feel like I’ve just hit the tip of the iceberg. As I get deeper and deeper in the process, I discover more issues and points at which the system breaks down. At the end, I don’t know how everything will work out. But we’re pursuing thousands and thousands of dollars right now in missed royalties, just on the performance side. This is just from promos and television shows that have run hundreds and hundreds of times and just slipped through the cracks. So, here’s our process. First, find out if a cue sheet or promo form was filed. ASCAP will post these directly to your writer’s member access account, and I believe BMI will be doing the same thing very soon. If not, then check with the production company and get a hold of the cue sheet. Make sure your track is on there and the information is correct the same way it is registered with your PRO. Then, make sure that cue sheet is filed with your PRO. We always open a claim to have them then recalculate royalties based on the new cue sheet submission or the revised cue sheet. And be patient, because this process can take a while. To learn more about Jon LaCroix and the work he does, visit the VTown Cartel Music website. You can also follow the company on Facebook and on Twitter. To learn more about how TuneSat is helping artists recover royalties, check out the Musician Coaching interview from last year with TuneSat COO Chris Woods.